Are you tired of having dull, dry skin? Are wrinkles and blemishes a growing problem for you? What about stubborn adult acne? Perhaps your skin is sagging and lifeless? As a holistic nutritionist, I have spent years experimenting with natural skin care products that are pure and organic, but also leave your skin glowing, blemish free and healthy from the inside out. You see, this is where virtually all of us get it wrong. We have been taught that we only need to treat our skin topically. This is a big mistake. 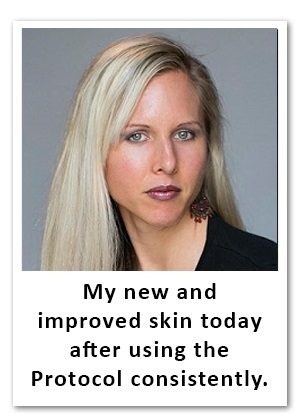 It is vitally important to recognize that your skin is an organ. In fact, it is your body's largest organ. Yes, you must care for it topically BUT also internally. My protocol addresses this issue which actually makes you and your skin healthier in time. It is not a cover up. It heals and supports the systems in the body to ensure that your skin continues to 'glow' as you age. If you would like to make dramatic changes to your skin in only a few short weeks, please keep reading. You've probably been promised this same thing by dozens of other products and been disappointed each and every time. I know I was before I figured out that the chemical laden, laboratory enhanced topical substances I was applying to my skin each day AND spending a fortune on were never going to solve my skin issues because they didn't deal with the root causes. The fact is nutritional deficiencies create and cause most of your skin issues. It is very important that you accept this fact or else you will continue to spend money on the latest and greatest miracle potions...only to end up with the same disappointing results each and every time. The secret to glowing skin at any age is this: If you eliminate little known BUT common nutritional deficiencies you will make dramatic improvements to your skin in a matter of weeks and in most cases DAYS. That makes your job easy if you want to dramatically improve your skin. 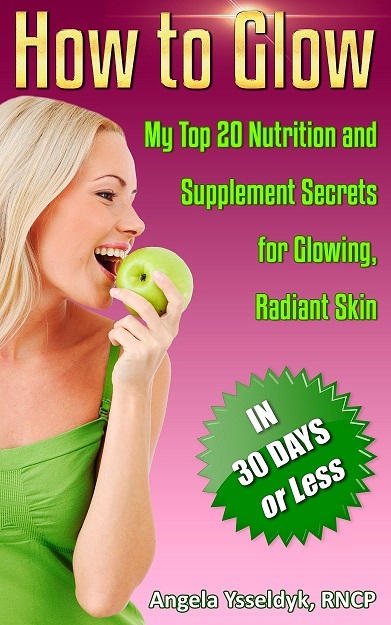 You must first learn exactly which nutrients fix skin problems fast. These little known secrets won't be told to you by your dermatologist. That's because they are too inexpensive. Yes, inexpensive. They won't cost you thousands of dollars or even hundreds and frankly, that doesn't interest most dermatologists. After years of experimenting on myself, I figured out the exact combination of safe, natural ingredients that worked miracles both for my skin but also for my clients. The truth is when I combined these three products in the correct doses for the first time, I simply could not believe the results I obtained in a matter of weeks. Complete strangers were literally telling me that I was "glowing." My husband couldn't believe the results. My family asked me what I was 'having done.' As you can see in my recent picture (absolutely no Photoshop or editing was done), my skin now has the healthy glow I'd been after since my teens. "Honestly never in my life have I had so many complements. Not sure which product it is but I was told I look like I am getting younger!!!" My Glowing Skin Protocol will change your skin from the inside out, eliminating dryness, blemishes and acne while boosting firmness without harmful chemicals, fragrances or parabens. There are three products in the Glowing Skin Protocol: the So Ho Mish Miracle Cream, Collagen Plus Collagen Support and GLA SkinSmart Oil. Each product is scientifically proven to address a different aspect of skin health. So Ho Mish Miracle Cream: You've probably never heard of this cream but quite simply, this is the best facial moisturizer you'll ever use. It doesn't look like a typical moisturizer and it doesn't smell like your typical moisturizer. That is because it does not have the ingredients of a typical facial moisturizer. It contains only natural, fresh ingredients, most of which you've probably never seen in your moisturizers before. Ingredients like raw honey, royal jelly, bee pollen and propolis. These substances all come from the bee hive and have powerful, clinically proven moisturizing, cleansing and healing properties. GLA SkinSmart Oil: Almost no one knows about this ingredient. Beautiful skin begins with a very special fatty acid called GLA (gamma linolenic acid). GLA is one of my secrets to glowing, wrinkle-free skin. The truth is you begin losing the ability to make it as you age. Stress and pregnancy also reduce your ability to make it. GLA has been shown clinically to maintain the stability and fluidity of the natural water loss barrier in our skin and to reduce wrinkles. GLA is vital for keeping skin cells moist and strong while improving the barrier function of the skin. Taken internally, you need one teaspoon per day in order to 'glow'. I also recommend applying it topically for maximum benefits. Collagen Plus Collagen Support: Collagen is the protein that makes your bones, nails, teeth and hair strong. Collagen also plays a critical role in skin health. You have probably noticed how baby skin is so soft and smooth. Youthful skin is abundant in collagen and elastin fibers that lock in moisture and keep the skin firm. As we age, however, collagen production naturally declines by about 1 percent a year starting in our early 20s. Women in menopause are especially susceptible to collagen deficiency. Research shows that women lose as much as 30 percent of their skin collagen in the five years following menopause. And as if that is not bad enough, skin elasticity declines 0.55 percent per year after menopause. It is the loss of collagen that causes sagging skin and wrinkles. You must supplement with it in order to have glowing, radiant skin. I am so confident that you will absolutely fall in love with the Glowing Skin Protocol that I am willing to give you 45 days to try it out. If after 45 days you do not find that it is improving your skin dramatically, I will give you your money back no questions asked. Now, you might be wondering how I'll do that after 45 days and you've used up the Protocol. It's simple - send me the empty bottles and I'll still give you your money back. I believe that strongly that The Glowing Skin Protocol will dramatically improve your skin. Bonus FREE e-book with Purchase! So Ho Mish: Distilled Water, Raw Honey, Bee Pollen, Bee Propolis Tincture, Balsam Oil, Glycerol Stearate, Lanolin, Balsam Tincture, St.John's Wort Tincture, Royal Jelly and Potassium Sorbate. GLA SkinSmart Oil: GLA from Canadian Borage seeds. Collagen Plus Collagen Support: Silicon (Silicic Acid) 1 mg, Biotin 50 mcg. Take one teaspoon of the GLA Skin Oil per day with food. Take 10 drops of Collagen Plus per day mixed in juice or honey. 1. How quickly will I see results on the Glowing Skin Protocol? A - This depends on several factors, the most important being you. Things like age, current skin health, nutrition/hydration and genetics all contribute to determining this. Generally speaking, most users start to see results in 10 to 14 days. I have been using the program for longer than one year and my skin is the healthiest it has ever been. 2. Is The Glowing Skin Protocol suitable for all skin types? 3. Will I need to continue to take the Glowing Skin Protocol long term? 3. What should I eat while using the Glowing Skin Protocol? A - Your nutrition is extremely important to the 'glow' of your skin. Listen to my interview on Exploring Mind and Body Radio where I discuss Georgous Skin Through Diet. If you are taking my Glowing Skin Protocol, I would highly recommend you consume my Glowing Skin Smoothie several times per week or every morning to supercharge your results. The Smoothie recipe below contains the GLA Skin Oil and the Collagen Plus drops, which is a tasty way to get these skin boosting ingredients into your body! Mix the following ingredients into a high powered blender for Glowing Skin in a matter of weeks! 1 and a half cups reverse osmosis water: to hydrate your skin and prevent it from drying and peeling. ½ cup high antioxidant frozen berry mix (pomegranates, blueberries, blackberries and cherries): eating a diet rich in antioxidants can help improve your health, protect your skin and hair from aging. ¼ Banana: banana fruit has nutrients that are essential for the skin. They contain significant amounts of vitamin C and B6 which play vital roles in maintaining the integrity and elasticity of the skin. In addition, the large amount of antioxidants and manganese present in bananas protect the body from damage caused by oxygen free radicals which lead to premature aging of the skin. 1 TBSP Bee Pollen: high in antioxidant polyphenols and flavonoids to slow skin aging and B-vitamins help heal skin. 1 tsp Raw Royal Jelly or ¼ tsp Freeze Dried Royal Jelly: high in 10-HDA, a fatty acid to boost moisture content in the skin. It is also high in silicon, a precursor to collagen, and other minerals the skin needs and loves. 1 TBSP Milled Flax seed: high fiber flax will keep your bowels moving and this helps keep detoxify your skin. It also contains Omega 3 fatty acids which are also important for skin health. 10 drops Collagen Plus: this builds collagen in your skin and bones, increasing firmness. Within two to three months, you will notice an improvement in the smoothness of your skin and in the strength of your hair and nails. 2 tsp GLA skin oil: GLA is a component of healthy skin and helps to maintain the stability and fluidity of the natural water loss barrier in our skin. Skin disorders like eczema, psoriasis, rosacea, dermatitis, cradle cap, acne and dry skin occur if you are deficient in GLA. GLA is vital for keeping skin cells moist and strong while improving the barrier function of the skin. 2 scoops Brad Kings High Alpha Vanilla Protein OR 1 scoop Vega’s Sport Protein: Protein is essential for the body to maintain, repair and build body tissues including muscles, organs, skin and hair. The side effects of inadequate protein intake can include a loss of lean metabolically active muscle tissue, unwanted weight gain, bone loss, compromised skin integrity, lethargy and compromised immunity. Directions: Add the water, berries and banana into a blender or your mixing cup. Blend together. Add in your bee pollen, flax, royal jelly and blend again. Option to add in 1 tsp of raw honey and 1 dropper of alcohol free propolis drops if you are feeling a little under the weather. Finally, add your protein, GLA oil and collagen plus last and only blend for a short period so as not to damage the protein bonds. Pour and enjoy!